The Leg Wedge Pillow from Better Sleep Pillow is a dual purpose orthopedic pillow is the ultimate leg spacer pillow. When in the folded (closed) position the Leg Wedge Pillow fits between the thighs or legs fitting the natural curves of your body. When in the unfolded (open) position it elevates feet and legs to reduce leg tension and promote circulation. The Leg Wedge Pillow is two pain relieving pillows in one. The memory foam used in the Leg Wedge Pillow comforts you as it helps relieve pressure and tension throughout the night. It even moves with you as you turn from side to side helping you get a more restful sleep. It is great for people with hip joint pain, lower back pain, knee joint pain, varicose veins, poor circulation, leg muscle cramps, restless leg syndrome, ankle joint pain, diabetes or vascular problems. The Leg Wedge Pillow is covered in a comfortable terry cloth cover. The supportive memory foam hugs and cradles the legs to reduce pressure and promote better circulation. The reduction in tension and pressure and tension will help you sleep better and reduce morning back pain and stiffness. 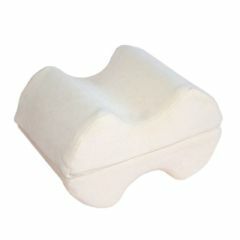 The dual use pillow can be used to separate knees or thighs or elevate lower legs or ankles. It is great for anybody that is having trouble sleeping due to discomfort. Sleep better and wake up more comfortable using the Leg Wedge Pillow. Get yours today from Allegro Medical. Comfortable. Solid Construction. Multiple Positions. Comfortable. Multiple Positions. Easy to Control. Solid Construction. Easy to Control. Attractive Design. Multiple Positions. Solid Construction. Comfortable. This pillow helps keep my dad from rubbing his feet together and waking up with tingly and numb feet at night. It also helps to keep him from drifting down the bed and getting his feet pressed against the foot board. It kind of acts like a chuck for him. It can be used between the knees, too. Dad loves it, the nursing staff at his assisted living home love it, and I'm just so glad to have found such a product available. Thank you for offering it, and at a reasonable price, too. Multiple Positions. Solid Construction. Attractive Design. Easy to Control. Comfortable. This is a great product. We needed something to keep the patient's heels from rubbing on the bed. (This was to prevent bed sores.) Someone else had one of these and recommended it, so we purchased one as well. We were glad that we did. It can be used under the ankles, or between the lower legs so that the patient can sleep comfortably. It is nice to have something versatile that can be used in the open or closed position---eliminates the need for two different pillows! How thick is below when folded and used between the knees? What is below dimensions? I am paralyzed and need pillow to keep kness from touching and keeping my hip in proper alignment while sleeping on side. may i see a picture with a leg in it? i sit for 10hrs a day and my right leg has lots of pain, would i need a leg pillow or a seat cushion? Is this product for one leg or for both? Yes and yes! I used this wedge pillow for my broken ankle, but the great part about it is the two curved sections velcro together. When unfolded, you can technically use for propping both legs (maybe on top of some pillows to rest a sore back). Since most medical professionals suggest elevating a leg/ankle/foot following an injury, you get more out of this product when you put on top of a stack of pillows. It worked well for me and when my brother broke his ankle just 6 months following my injury, I shared this product with him, too! Is there a picture of the wedge with a leg in it? how long is the wedge? The wedge is 21 inches long unfolded and used for both kegs - 10.5 inches when folded and used for one leg, It is 7.5 inches wide and 7 inches tall when folded - 3.5 inches when ubfolded.